Jean Harrison provided this photo at the Brentford Local History Day in 2009. 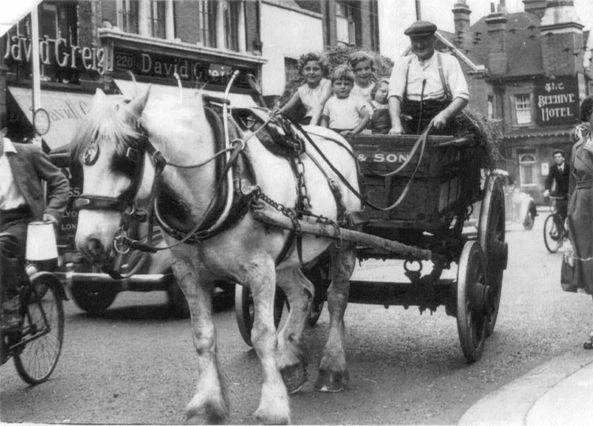 Jean is one of the little girls in the cart, which is being driven by Tom Hoare. The photo was taken on the High Steet a little to the west of Half Acre. In the background is the Beehive Hotel on the Half Acre / High Street junction and David Greig provision stores at 219-221 High Street. At the left is a man on a (motor? )bike carrying an enamel jug. I expect someone can explain!